Hieronymus. Honestly I had never heard of the brand before they contacted me a few months ago. Hieronymus is a luxury stationery manufacture based in Switserland. They make and sell hand-woven paper, desk accessories, and also a line of high-end writing utensils and inks. I received a couple of samples from their new ink collection, so that's what wel'll take a look at today! 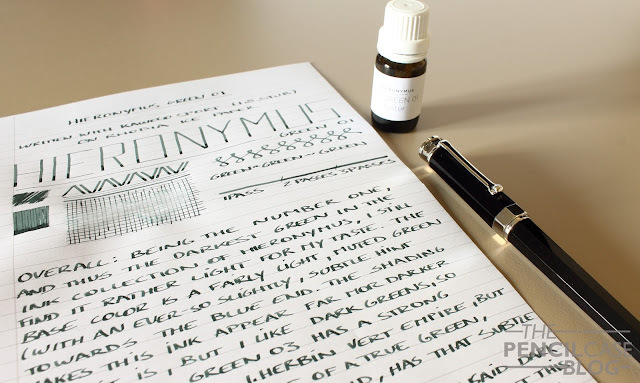 First up, we have a green ink, simply called: green 01. Green 01, is one that definitely works for me. (Here I am again, with my unexplainable love for subdued green ink) No, your screen didn't suddenly lose all saturation; that's actually how unsaturated these inks are. Hieronymus inks are categorised by color, with five main colors. 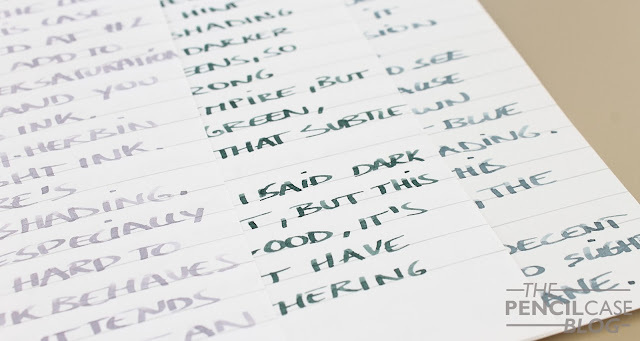 Each color (brown, violet, blue and green, grey/black) is split into three 'shades' of ink. From what I can find on their website, the number 01 should indicate that it's the darkest, most saturated ink, down to number 03 that is sort of a washed out, pastel color. 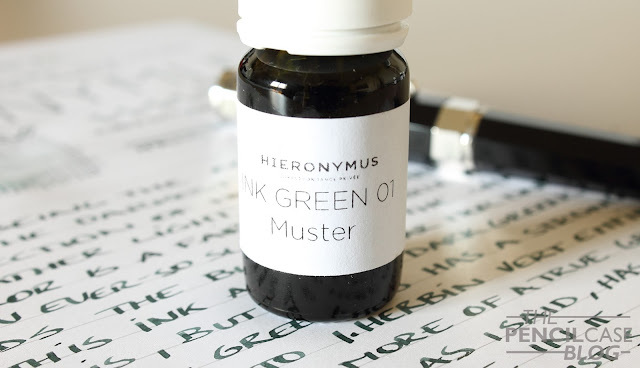 In reality, this Green 01 is still a fairly unsaturated ink compared to other dark greens from different brands. As far as saturation goes -or the lack thereof- I find Vert Empire from J.Herbin quite comparable. For a green ink, it has a very obvious hint towards the blue spectrum when you compare it to some other inks. In the comparison below, it clearly shows that blue hue. In this area, there's a noticeable difference between this and Vert Empire, where Empire is definitely a greener green (#bestdescriptionever). There's a fair bit of shading, but it doesn't always show equally. In some areas, especially with longer strokes the shading appears almost completely black on a rather light base color, other places show less pronounced shading, more towards dark green. Performance is good, nothing out of the ordinary, but definitely good. It's a fairly wet ink, and it feels a bit watery as opposed to more lubricated inks like Iroshizuku or Pelikan Edelstein. The less lubricated feel doesn't bother me the least. If it really is more watery, it doesn't show in a negative way. It doesn't feather or bleed, so it's not really an issue. 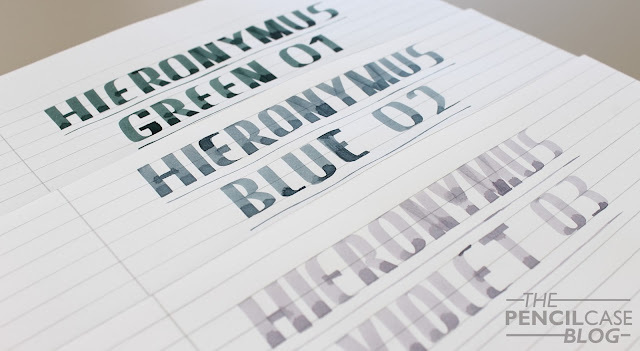 Note: I received this ink sample free of charge from Hieronymus, so I could write this review. I was in no way influenced in the making of this review, the opinions shared here are completely my own! This review does not contain any affilate links. Hi. Great review. From your pictures I also find the subdued green attractive. The blue is nice too, but the purple seems a bit too transparent for my taste.